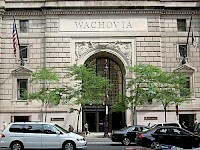 The Wachovia Building, originally the Fidelity-Philadelphia Trust Company Building is a skyscraper located in Center City, Philadelphia, Pennsylvania, United States. The Beaux-Arts skyscraper was built for the Fidelity-Philadelphia Trust Co. in 1928. 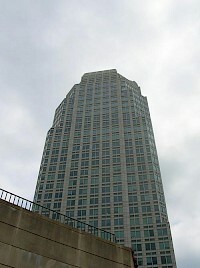 Designed by architectural firm Simon and Simon, the 29-story high-rise is listed on the National Register of Historic Places. 100 North Main Street is a postmodern, 460-foot (140 m), 34-floor office skyscraper in Winston-Salem, North Carolina, USA. Originally named Wachovia Center, the building served as the corporate headquarters of Wachovia bank from 1995, the year of the tower's construction, to 2001, the year the corporation merged with First Union and moved its headquarters to Charlotte, North Carolina.